Recent improvements in Electronic Medical Records (EMR) functionality, integration, and practice management have significantly improved and transformed how hospital providers are not only adopting, but embracing the switch to a paperless environment. And why not? Paper is a waste of time and financial resources for hospitals and patients, alike, because it creates gaps in efficiency, security, and the patient experience. Take security, for example. If a facility stores paper records, the records can easily be accessed by unauthorized individuals, or they can be destroyed in the event of natural disasters or a fire. Hospitals that rely on paper forms in any phase of operations—from patient intake to accounting and compliance—face significant operational hurdles that can hamstring employee productivity and the ability to deliver top-notch service to patients. At the top of the list is patient duress. A patient entering the hospital environment is likely there due to serious illness. The last thing they are capable of doing is filling out tedious paper forms. Likewise, outdated or hard-to-use technology only adds to patient and staff stress, which can create an overall negative patient experience. The HIMSS Analytics Electronic Medical Record Adoption Model (EMRAM) recently mandated adoption of health information technology, like EMR, to modernize America’s healthcare delivery system. Hospitals that have already implemented EMR programs into their business models are beginning to assess how these systems can provide better value on both sides of the provider/patient fence by adopting EMR optimization practices and solutions. In a nutshell, EMR optimization is the process of continually tuning and customizing your hospital’s EMR software to serve your particular organization’s needs by further improving productivity and profitability. In the next section, we’ll take a look at the logistical considerations your hospital should evaluate as you take meaningful steps toward becoming a truly paperless hospital. EMR optimization—and its success—requires that all key stakeholders at your hospital are on board regarding end goals and dedication to the task at hand. From top-tier executives to IT managers to health information management (HIM) staff and clinical staff, all have important roles in planning and executing positive outcomes. A successful optimization plan starts with having a department head or team leader who is capable of making strategically sound decisions and is efficient at managing the entire process for his or her particular sector of hospital operations. The department head will typically be responsible for acting as an optimization project manager, ensuring that timelines are being adhered to and that the communication regarding updates, launch dates, vendor relations, hardware issues, and task delegation to other team members is timely and clear. Even more importantly, though, department heads are able to provide key analytics toward optimization goals, such as revenue cycle risks associated with self-pay collections, claims and gross revenue, and other big-picture metrics. Before EMR optimization is even considered, the basic functionality of the EMR technology currently in place needs to be understood, and time is needed to adjust to its capabilities and the related process changes. Once this is accomplished, the conversation changes from implementation to EMR optimization possibilities. Some of the most important players on the optimization roster are IT staff. Hospital IT projects are costly, reaching billions of dollars in some cases. IT staffers should review upstream and downstream workflows to determine gaps and inefficiencies in the EMR environment. It’s not just about reducing the number of steps required to collect, review, and input patient data, which is a frequent complaint among hospital caregivers. The goal is to get patient data into the system as efficiently and accurately as possible. An IT optimization staff is key to making that process easier for end users. Committing to the optimization of EMR systems is not like waving a magic wand. Its success or failure is highly dependent on getting clinical staff and physicians on board. That starts with clear messaging from the very beginning regarding expectations and process. Why? Physicians and nurses are trained to render care, not spend most of their day clicking through an obsolete EMR system. Inefficient EMRs significantly impact productivity, patient care quality, and return on investment. A good HIM staff is vital to the success of any optimization project for a number of reasons, but most importantly because they can act as interdepartmental liaisons who bridge the gap between the hospital’s numerous occupational specialties and departments. With the transition to an EMR, many hospitals are merging clinical information with financial information, which can foster ambiguity and confusion regarding the exact roles employees play within their organization. In some cases, departments merge, but employees aren’t cross-trained to be e cient within the new departmental structure. A good HIM manager can smooth out the process for staff that find it hard to embrace change. According to the U.S. Health Information Technology office, as of 2015, about seven out of every ten hospitals allowed patients to download, view, and transmit their health information online. 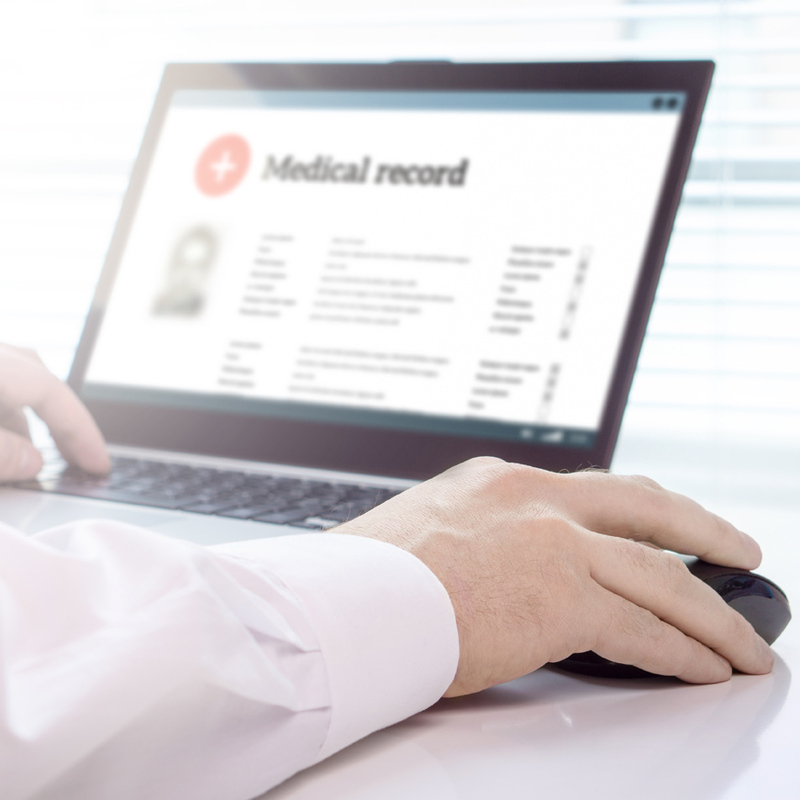 Patients already access information online and via mobile platforms, so any optimization policies or programs should make it very easy for patients to not only complete eForms but also embrace the value they bring in replacing cumbersome paper forms. Change management is one of the main challenges for EMR optimization because problems with usability, security, training, reliability, and support often occur. These issues frustrate hospital staff and patients alike. The goal is to get staff who are accustomed to paper—because that’s what they’ve always used—to embrace the value of new technology, not protest its adoption. The old way of having multiple staff members pull patient records, print, and manually distribute them among relevant parties is mostly a thing of the past. Today, patient records and other hospital data are distributed to staff electronically, cutting down expenses and time. Work flows need to be carefully mapped out to reduce redundancies and improve the entire optimization process across the organization, not just in IT. Making improvements to the functions of just a few departments is not the goal of optimization. Interoperability among all departments should be a key focus when orchestrating an optimization plan. Intake/Admissions: Resource-wasting steps like scanning patient records with traditional paper forms are eliminated. Medical Records Department: Patient information is shared instantly with centralized clinical and administrative forms. HIPAA compliance and interoperability are boosted because systems are locked down within your own IT ecosystem. Clinical Areas: E-form data is shared only with the people who need to see it and the IT systems that need to store it. HR: Functions like employee on-boarding, performance evaluations, employment applications, and benefits management can be handled online through a single portal. Finance: Document loss and reworking of billing data is reduced by eliminating paper records. As you can see, there’s a way to implement EMR at a hospital, and then there’s a way to do it correctly—a less painful way that yields far better results. We’ve reviewed how to get the ball rolling in this blog, but stay tuned for the second blog of this two-part series to learn how to optimize your EMR once in place.